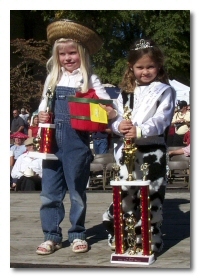 Girls 0-12 years of age are invited this year to compete for the titles of Wee blossom, Little Miss Apple Blossom, and Jr. Miss Apple Blossom. Each contestant will need to dress in their best farm or country girl outfit. Judging will be based on costume, personality and presentation. The contest is Sunday, Oct. 20th, sign in is at 3pm, dress rehearsal and judges chat , followed by the on-stage contest at 4pm. There will be 3 age divisions: 0-2 years, 3-6 years and 7-12 years. Entry fee is $20 per contestant. You must enter by October 11th, 2019. No entries will be received after this date or at the festival. Questions can be sent by CLICKING HERE. Contestants for the Wee Blossom ages 0-2 years and Little Miss Apple Blossom must be between 3 and 6 years of age and for Jr Miss Apple Blossom between the ages of 7-12 years by the actual date of the pageant (Sunday, October 20th). Proof of age may be requested. Contestant child’s ticket and (1) parent, mother or father are allotted for entry to attend the festival on the day of the pageant. The contest takes place Sunday, October 20th at 4pm. Contestants must sign in at the contest table by 3pm and attend a dress rehearsal and judges chat. a) Be interviewed on stage by our Master of Ceremonies during contest. b) Appear in a farmer type or country style outfit. c) Participate in a pre-contest judges chat. d) Not to wear make up. Contestant agrees that the decision of the judges is final. No make-up allowed. Hair must be age appropriate. 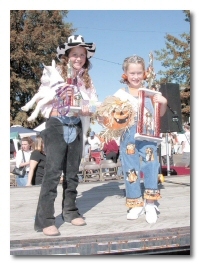 All contestants must be accompanied and supervised by a parent or legal guardian during all contest proceedings. There will be one grand prize title awarded in each age bracket. There will also be one runner-up prize in each age bracket. Overall 1st, 2nd, and 3rd place prizes awarded. Prizes awarded for Best Personality and Most Creative Outfit. All contestants by entering, agree to allow The Cleveland Apple Festival™ and/or it sponsors to use their likeness and names for publicity purposes relating to the festival and/or the Apple Blossom Contest. Immediate family members of employees and/or directors of The Cleveland Apple Festival™ cannot enter this contest. The Cleveland Apple Festival™ reserves the right to limit the contestants should the amount of entries become larger than can feasible be judged by the judging panel in the allotted time.